Pizza and meat go together like...well...pizza and meat, I guess. But if anyone is familiar with putting meat on top of pizza, it's Frank Maimone, owner of Rustica Pizza in the Northern Liberty neighborhood of Philadelphia. If I'd known about this restaurant before last week, I probably would have a different reaction to his scrapple pizza. Instead of, "THAT'S AMAZING THAT'S AMAZING THAT'S AMAZING!!" I would have said, "Dude, what took you so long?!" Regardless, here we are. Rustica Pizza has created a scrapple pizza and it sounds tremendous. Drizzle some Pennsylvania maple syrup on top. Then after it's cooked, squirt some ketchup on each slice. You can see from the photo, we're not talking about a few crumbs of scrapple either. Whole slices! The scrapple itself is deep fried before putting it onto the pizza and into the oven. They slice it a bit thicker than normal so it stays soft in the middle (as scrapple should be) even after frying and cooking inside a 600 degree oven. 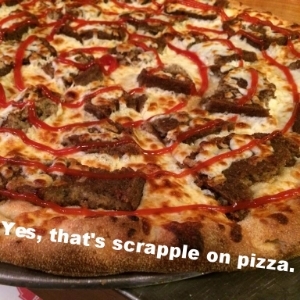 How Did the Scrapple Pizza Get Made in the First Place? Rustica is next door to a tavern named Standard Tap. One day after their brunch, one of the folks from Standard Tap came over to Frank with a brick of Habbersett scrapple and said, "Can you do anything with this?" 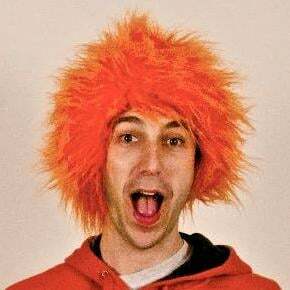 Frank made the creation above thinking it would be a one-time thing. "Literally 5 minutes after it was out of the oven, it was gone." And now Frank's buying 30lbs of scrapple a week to make this pie every day. Rustica has been experimenting with the recipe a bit, recently introducing sunnyside up eggs and sriracha ketchup to the mix; scrapple pizza turned up to 11. I don't live in Philadelphia, but I know my friends that do will be seeing me soon so I can get some of this pizza into my belly. Rustica, welcome to #ScrappleNation.